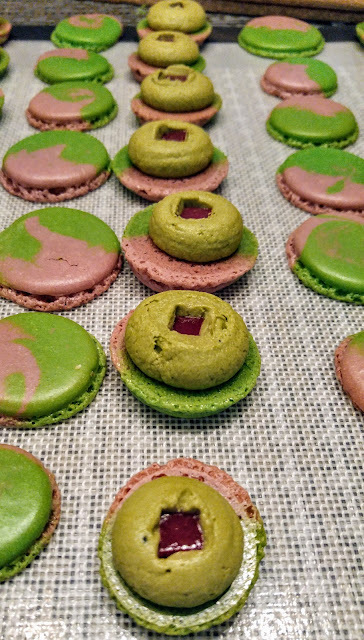 My first attempt into making marbled macarons with a matcha and raspberry filling. The swirled pattern comes from mixing two different colours of French Macaron batter instead of dipping the tops into icing. 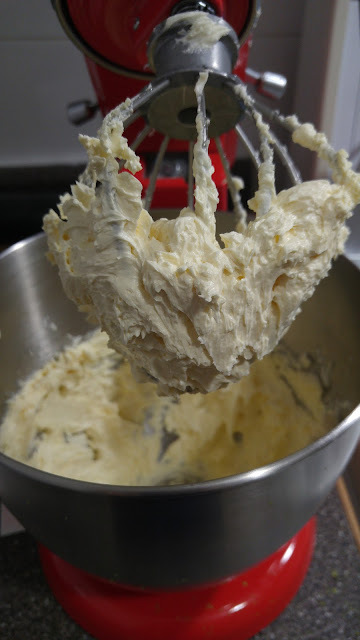 Multi-Bag Method: Split the batter into two different batches, colour them (with gel food colouring), and then fill into individual piping bags and then join them into one large piping bag. Single Bag Method: Split the batter, colour, and then pour both into the piping bag at the same time for a marbled look. 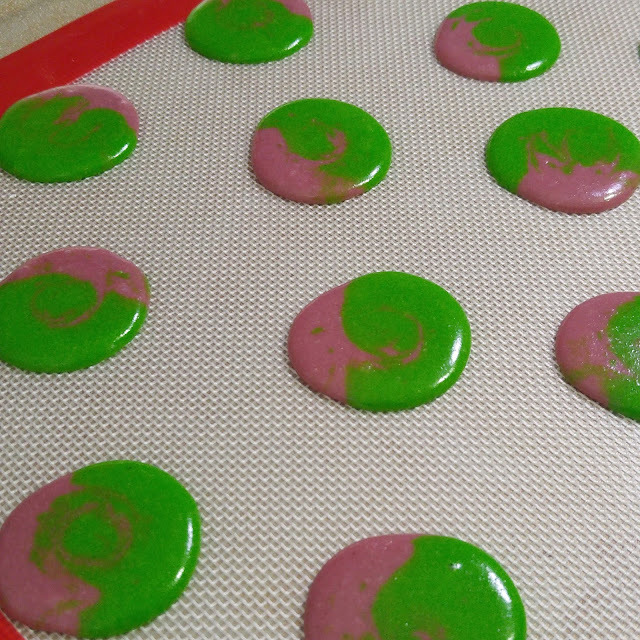 Dipped Method: Make macaron shells as usual, then dip the macaron tops into a coloured marbled icing. At this point in time (January 2017), I somehow thought that the first option would be the easiest. I used my standard french macaron recipe, but I split the dry ingredients into two equal batches. 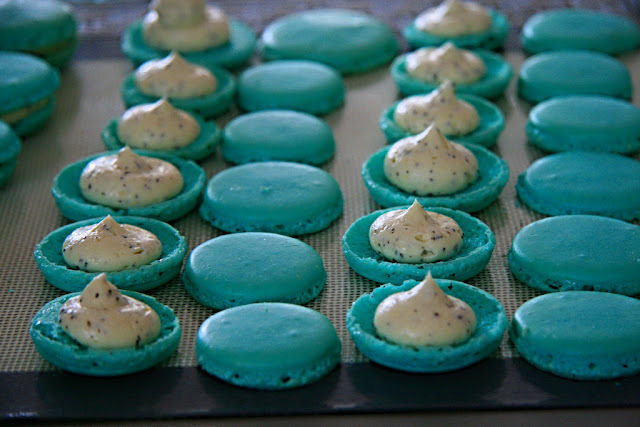 Then, I did the macaronage individually for each individual batch and coloured them. One batter with Wilton Rose gel food colouring and the other with Wilton leaf green gel food colouring. Then, I transferred each coloured macaron batter into its own piping bag and then inserted into a larger piping bag. I had chosen the first method since I thought it would be hard to combine both batters into one bag while keeping the colours separated. Unfortunately, I didn't take a video or a picture of how it the piping bags looked since it was very much all in the moment. I did however take a picture of what the piped marbled macarons looked while they were resting. As you can see, because they were in two different bags the batters stayed separate and did not really combine together. Also, despite trying to ensure that the dry ingredients were exactly the same amount, it appears that I had more green batter compared to the pink batter which is why the green batter seems to take over. I suspect that even though I had weighed and split the dry almond meal & icing sugar mixture, the resulting two batters were not exactly even. In the above picture if you look closely at the shell of the macarons, one side of the macaron rises higher than the other while one side seems more flat. 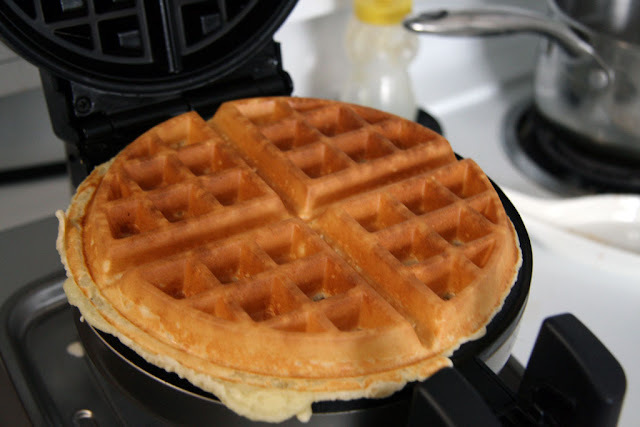 There also appeared to be more green batter than pink batter. In some of the macaron shells they also started to wrinkle or cracked as the mixture was not 100% equal in both. 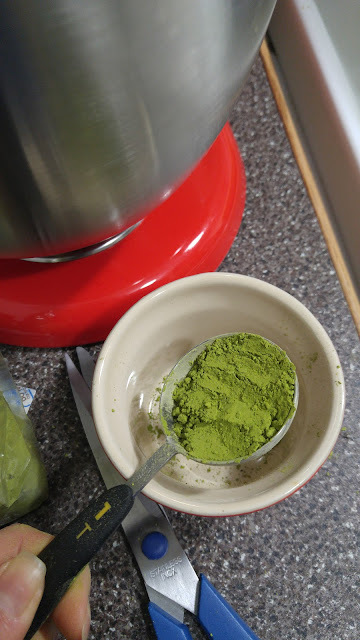 In previous posts, I have talked about making my Matcha Buttercream Recipe. I really like the matcha buttercream that I make as it is so versatile for not only icing a chocolate cake, but also as a buttercream filling. 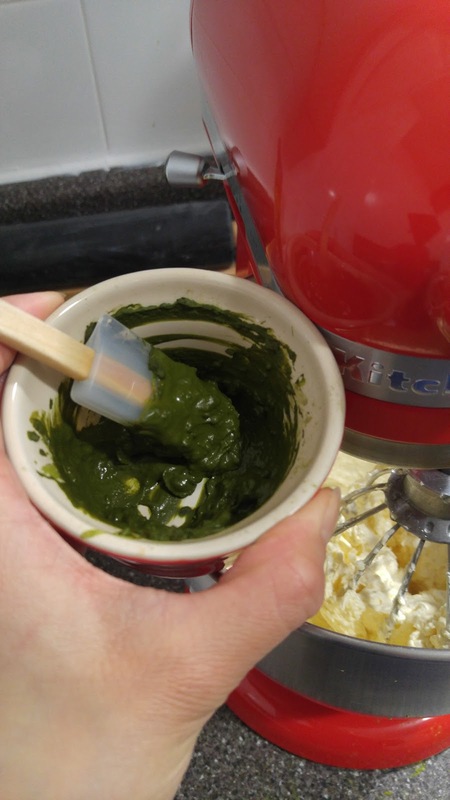 The Matcha buttercream is also not too sweet or bitter. 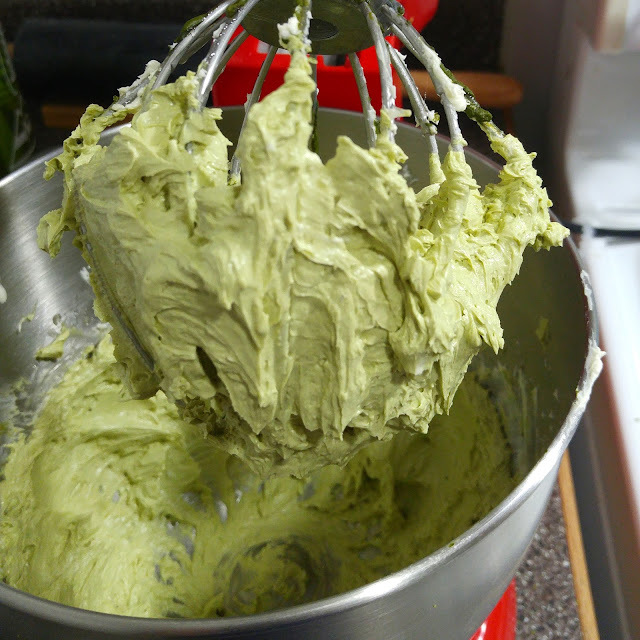 The buttercream naturally becomes a green colour from the matcha itself; no added food colouring! Pipe about 3/4 of the amount of matcha buttercream you would normally fill a macaron with. Pipe a small amount of matcha buttercream on top of the jelly. 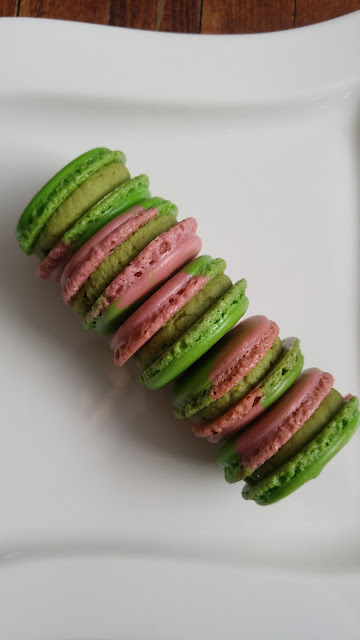 Close the macaron by putting the top shell back with a slight twist. 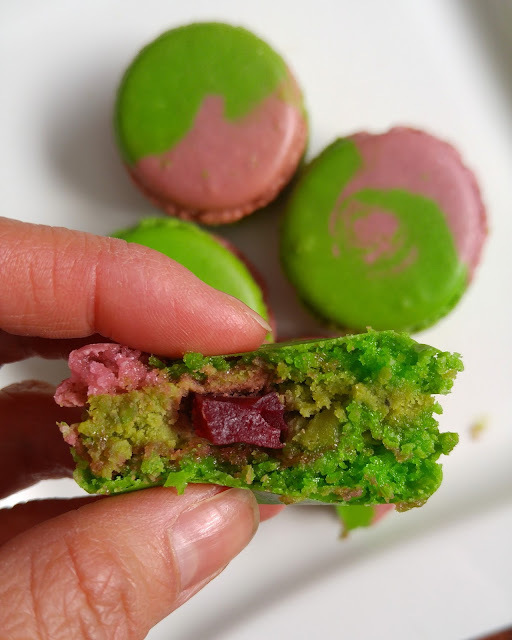 While these Raspberry Matcha Macarons did looked marbled, had relatively smooth tops (with a few exceptions), and had the crucial ruffled edge (pied- feet), I wasn't that happy with the colour mixing. I had hoped that they would be more swirled but instead they look more like two colours side by side with minimal mixing in the division. This method also ended up using three bags instead of just one bag for piping. In terms of flavours, I have made macarons with a raspberry jelly before (from my Ispahan Macarons) and matcha buttercream when I made Matcha Macarons. I am glad that the green tea flavour from the matcha worked well with the brightness of the tart raspberry jelly. 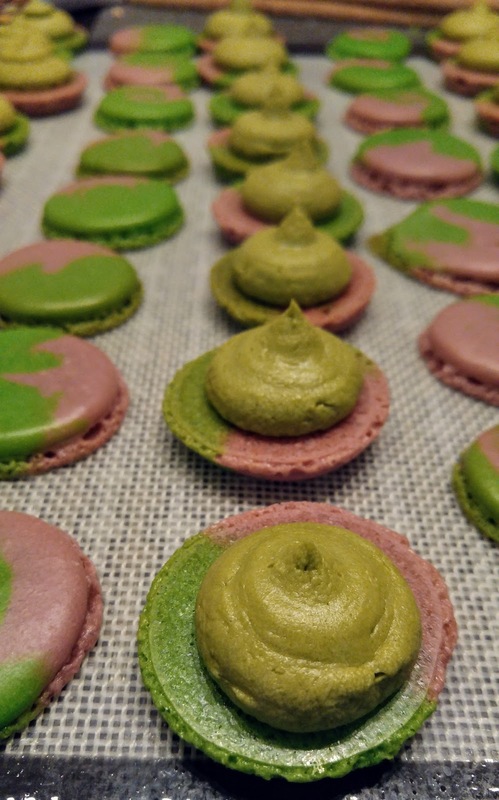 The macaron shells are not too sweet and work well with the matcha buttercream and the slightly tart raspberry jelly. So, would I use this method again? Definitely not as it used up more piping bags (3 versus 1) and the resulting look of the Raspberry Matcha Macarons did not look like what I had envisioned.